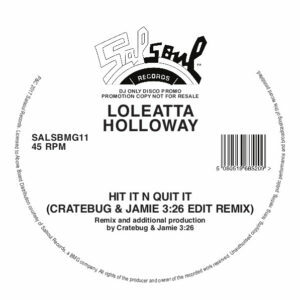 Yet another solid gold modern reimagining of the mighty Loleatta Holloway, this time her infamous 1977 smash 'Hit & Run' goes under the knife and is tweaked to devastating effect by 2 of Chicago's finest modern day editors - Jamie 326 & Cratebug. Anyone with even a passing interest in Disco or House will be more than familiar with these 2 guys names. Having edited and remixed numerous cuts in their own original ways, they take this all-time Salsoul classic and strip it right back to the essence, to the very basics, and in the process create a total dancefloor weapon. This edit originally came out a few years ago (2013) on a compilation that showcased the new wave of contemporary talent emanating from the Windy City and naturally it was one of the cuts that stood out, finding favour with a wide variety of DJ's across the board from Motor City Drum Ensemble, Todd Terry, Jeremy Underground Paris, Theo Parrish and more. Drawing comparisons with Paperclip People's anthemic 'Throw' from 1994 in the way it snatches a killer loop from 'Hit & Run's' bassline, 'Hit It & Quit It' is a monster, a record you'll literally play over and over and over again, a relentless Disco juggernaut that oozes power. It made perfect sense for this legit single-sided reissue 12" to come out on Salsoul Records, the home of Loleatta Holloway's finest material and all of her classics. This limited reissue has been made in conjunction with Jamie 3:26 & Cratebug and Salsoul Records, 100% sanctioned and lovingly re-presented for your dancing pleasure. This one is HOT. Sleep at your peril!